Abby Spitler may have been thinking that she was well on her way to winning the Peter Geraghty Invitational for the second year in a row when her coach stepped onto the course and stopped her. It was then that she had the embarrassing realization that she and her teammates ran a mile in the junior varsity race. Spitler and her teammates walked off the course and began preparing for the varsity race thirty minutes later. The girls varsity race was delayed 20 minutes, giving Spitler and her team more time to recover from their hard mile. When the race started, she found much better competition than the previous race. Century's Maura Linde fired off the starting line like a rocket. Linde led the first mile, but soon Elizabeth Tauber of John Carroll and Madeline Dulac of McDonogh joined her up front. The two IAAM rivals slowly took over the lead and began to put ground on Linde. It came down to the final straightaway where Tauber held off Dulac in an exciting finish, 19:10 to 19:12. Linde finished third in 19:21. Stephanie Joson of Quince Orchard was in fourth place for most of the race, leading Spitler, Katie Koenig of Good Counsel, and Britt Eckerstrom of Northwest. Over the final half mile, Spitler moved up and outkicked Joson to be the top Montgomery County finisher 19:29. Joson outkicked Koenig for fifth 19:31 to 19:32. Eckerstrom was sixth in 19:47. It was a big improvement from last year for Joson, who said she felt great during the race. As for Spitler, she jokingly said afterwards that they ran the first mile of the JV race on purpose just to show how tough they were, but she said she felt fine despite the blunder. In the mocorunning preview article for this meet, it was predicted that Bishop O'Connell would win but it would not be a blowout. That was half right. It was a complete blowout. After a few runners went out too hard in the first race at Great Meadow last weekend, O'Connell coach Cindy Walls wanted the girls to learn a lesson in pack running. She knows her team will not have a very strong standout runner this year like they have had in the past and requested that all of her girls hit the first mile together in 6:30. They executed perfectly. Tightly packed for the first mile, the pack did not spread out much over the remainder of the race. Freshman Devin Nihill outkicked fellow O'Connell newcomer Sarah McCarthy for tenth place in 20:28. Hilary Lee of South River broke up the team's top five runners as Ashley Stumvoll, Emily Blagg and Michelle Van Horn finished in 13th, 14th, and 15th. The team had a top five spread of 18 seconds. They had two more girls under 22 minutes in the varsity race and two more in the junior varsity race. Bishop O'Connell is focusing on winning the WCAC Championship, Arlington County Championship, and VIS Championship this year, but perhaps their greatest team challenge will be when they go to Cary, North Carolina for the Great American Cross Country Festival. When asked if they would consider returning to Cary, NC for the NXN Southeast Regional Race, Walls said she was not thinking that far ahead and noted that her team is still very young. The favorite girls team in Montgomery County, Northwest, held out four of their top five girls and finished fourth. Britt Eckerstrom was the only member of their top five who ran today because she will not run next week. Next week we should see a nearly full strength Northwest team minus Eckerstrom at the Magruder Invitational. DeMatha's Cory Puffett entered this race not sure what to expect and just wanted to see how close he would be to Gonzaga's Billy Ledder. Puffett led the race from start to finish. Ledder was never really within striking distance. Ledder said that he had recently increased his mileage higher than ever before and was not feeling very good during the race. He finished third in 16:14. It was not Ledder, but Loyola's Matt Jablonski who kept the pressure on Puffett, but Puffett kept him at bay for the win in 15:51. Jablonski followed in 16:02. Puffett described pain that he had in his hamstrings and calves immediately after he stopped running, but believes it is only a minor ailment and unrelated to the pain he had at the end of track season. He couldn't be happier with his race today after his summer training was not as great as he was hoping for. He had surgery on his sinuses at the end of the track season that knocked him out for most of the month of June. All things considered, he is pleased with his run today and will be running at the Magruder Invitational next week where he will see Ledder again along with many of Montgomery County's top runners. 28 seconds behind Ledder, teammate Collin Leibold finished seventh in 16:41. Connor Ryan, Mike Crozier and Ben Zeiss took 15th through 17th in 17:00, 17:02, and 17:08. Gonzaga easily won the team title with 58 points. Gonzaga competed at the NXN Southeast Regional Meet last year and plans to return with a stronger team this year. Gonzaga's WCAC adversary Good Counsel put up a good fight to take second place with 81 points. 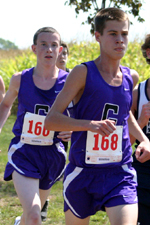 Kyle Graves and Jack Riely were the top Montgomery County finishers, finishing fourth and fifth in 16:23 and 16:24. Their #3 runner Michael Fitzgerald had a breakout performance, finishing eleventh in 16:53, seven seconds ahead of Gonzaga's 3-4-5 pack, but they just could not contend with Gonzaga's depth.